Few things light up our holiday memories quite as strongly as a beautiful banquet, and for many an area baker holiday thoughts are filled with the sweet taste of Grandmother’s pie. We caught up with four talented bakers who mused about the power of this humble pastry. Sweet or savory, fruit or meat, pie is an unmistakable part of the Midwestern holiday table, and it’s the source of many a fond memory – especially for lifelong bakers in the northwest suburbs. As our thoughts turn to the Christmas season, they also turn to those wonderful holiday meals. What better way to conclude a holiday feast than with a slice of warm, homemade pie? No matter what type you prefer, you can pretty much assume your holiday meal will end with some sort of pie. We’ve found four bakers in our area who share their love for the sweet treat along with some baking memories. Some chefs are inspired by a family member’s recipe, while others learned from their neighbors or an experienced chef. The result is a pastry made with love and spirit, just in time for the holiday season. David Bogash has been baking pies for 40 years, but by far his fondest memories of the pastry involve his mother. “My mom is the one who originally taught me how to make pie,” says Bogash, manager and head chef at The Atrium Cafe, located inside The Little Traveler, in Geneva. “She was an excellent baker. When you eat a piece, it’s like nostalgia because you always remember how good it tastes. His grandmother was also a renowned baker; it was she who taught Bogash to use lard, or pig fat, in the crust. Bogash is a graduate of the Culinary Institute of America, located in New York State. He also has a business degree from Monmouth College, in Monmouth, Ill.
After school, he worked at the former Mill Race Inn and the former Twin-Dor restaurants in Geneva. He also served as the chef at Art & Alma’s Century Inn, in nearby Burlington, for almost 25 years before he arrived at The Little Traveler five years ago. If you have in mind a fruit combination, chances are Bogash can create it. If you give him a 24-hour notice, he can make it however you want it. He also enjoys eating the dish, even when he’s not making it; pecan pie with vanilla ice cream is his personal favorite. But if there’s one pie he loves to make above all others, well, that’s another story. Bogash enjoys watching the responses he gets when serving pie. Each year around the holidays, Bogash bakes one for each employee at The Little Traveler. “I think there are more than 100 employees, and along with the holiday pies, I think I baked 170 pies from scratch within a three-day period last year,” he says with a laugh. Perhaps the greatest satisfaction, though, is seeing dessert coming out of the oven. As owner of Ella Bonella, a bake shop in Barrington, Andrew Mansour believes he holds a duty to the classic American pie. Mansour’s appreciation for good pie began when his English-born grandmother showed up every Thanksgiving with freshly baked pumpkin, pecan and apple pies for the family. But it was his Wheaton neighbor, Millie Stebel, who turned his love for pie into a passion. Millie died in 1998, but her memory and her baking live on. “I did find a recipe that’s very, very similar to Millie’s, and that’s what we use here at the bakery,” Mansour says. Mansour has also used the recipe at the now-closed Frank’s Karma Café in Wauconda. That’s where he realized how something as simple as pie could have a profound effect on the people who ate it. For 12 years now, each of Mansour’s homemade pies has been made following the same methods. Mansour doesn’t have a culinary background, but he believes passion is a pretty good substitute. Mansour always seeks out the freshest ingredients, so his pies are constantly changing with the seasons. Making pies from scratch can be challenging, but Mansour wouldn’t have it any other way. At Royal Oak Farm, in Harvard, crafting a new pie involves a lot of trial and error. “This is something that you learn on your own,” says Renee Norton, bakery manager at this family-owned apple orchard. Norton, who’s been working in the farm’s bakery for about 15 years, also uses some tricks from her mother, Gloria, who’s 82 and has been making pies since she was a teenager. Alongside Norton are two additional bakers who craft the desserts that are served up at Royal Oak Farm every fall and holiday season. None have culinary experience; everything is self-taught. Their hard work hasn’t gone unnoticed. Royal Oak Farm’s salted caramel apple pie recently won a contest hosted by the McHenry County Historical Society. Norton and her staff can create 13 varieties of the pastry dish from scratch. This time of year, customers are purchasing pumpkin pies by the carload, jokes Norton. But even through the busy times, the staff remains in tune with its art. Raymond Shaughnessy doesn’t think of himself as a professional baker, but his skills say otherwise. He currently serves as executive chef of The Fountains at Crystal Lake, a senior living community in Crystal Lake. With no trace of a recipe and music playing in the background of the kitchen, he quickly rolls out a pie crust from scratch, cuts the dough, makes a filling and assembles a steak-filled potpie with a flaky crust. After several minutes in the oven, out comes a hot, golden-brown savory dish. Each day, residents at The Fountains line up for a piece of Shaughnessy’s sweet and savory pastries. Shaughnessy was the food service director when he started at The Fountains 25 years ago. He left for awhile and just returned five years ago. Throughout his career he’s received culinary training in a number of settings. When he was 16, Shaughnessy traveled the world with various movie companies, including EMI Films and Paramount Pictures. By the time he was 25, he was the executive director for a local country club and a fine dining restaurant. Shaughnessy says he enjoys baking because he likes being creative and making others happy. Perhaps Shaughnessy’s favorite pies to bake involve those with more than one type of delicious fruit, such as a cranberry-peach combination. 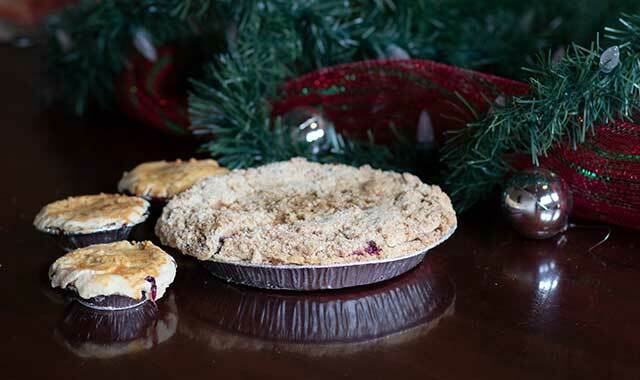 Whether it’s part of a holiday feast with loved ones or a sweet indulgence by oneself, Shaughnessy believes a nice piece of pie is the perfect way to finish any meal. This entry was posted on Wednesday, November 21st, 2018 at 12:00 pm	and is filed under Features, Top Posts. You can follow any responses to this entry through the RSS 2.0 feed. Both comments and pings are currently closed.